Many studies have shown that businesses with more gender-diverse teams, especially at the top management level, achieve higher financial returns, higher levels of innovation, and increased efficiency. However, a 2017 study by TechCrunch found that only 17 percent of startups were founded by women. The ICT4D sector has begun to recognize that this a problem for our field as well—last week’s ICT4D conference featured a panel discussion focused solely on tackling the issue of gender diversity in the ICT4Ag sector. 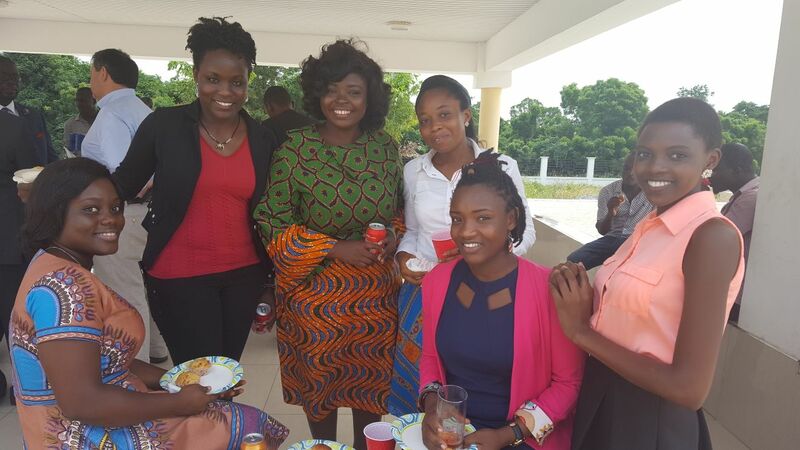 KIC Agripreneurs, from left, Nanette B. Johnson, Edna Sawe, Joyce Pobi, Padiki Bukare, Winnie Akoko and Margaret Aoko. Winnie Akoko and Margaret Aoko form one half of Team Unlimited, which is developing a tech product for livestock management called Anitrack. Using RFID technology, Anitrack enables cattle farmers to monitor the location and health status of their herd and also connects them with veterinary services. Unlike most of their fellow competitors, Winnie and Margaret are Kenyan—they came to Accra last year to study at the Meltwater Entrepreneurial School of Technology (MEST). Formerly a financial adviser for Britam financial services group, Winnie is Team Unlimited’s business strategist, while Margaret leads on product development. As co-founders of Complete Farmer, Joyce Pobi and Nanette B. Johnson are developing a platform for white-collar professionals who are new to agriculture and seeking to start a farming business as a source of secondary income. The platform aims to be a one-stop shop for their customers to access training services, agricultural experts, farm employees, and service providers. Nanette is an Agricultural Scientist, while Joyce leads Complete Farmer’s Marketing and Sales. Joyce Kobia is the chief operations officer at Farm IT. With a degree in agribusiness and agriculture, Joyce helps build the team’s data collection and consulting business focused on Ghana’s cocoa sector. These data services are intended to help aggregators and policy-makers in the cocoa sector improve decision-making and enterprise-level strategy. Linda Jalley is the Marketing Director for JLS Agric Services, which seeks to address one of the most widely recognized problems for smallholder farmers around the world: access to finance. It is doing so by creating an alternative credit scoring system for smallholder farmers in Ghana that uses mobile phones to collect data on farmers and a proprietary algorithm to analyze their credit worthiness. Jennifer Jayne Asante and Padiki Bukare are the female co-founders of QualiTrace, a team that is building a traceability system to tackle the chronic issues of fake agricultural inputs that plague Ghana’s small-holder farmers. Using technology that has been deployed in the pharmaceuticals sector, QualiTrace’s system allows farmers to text in codes to verify that they are buying quality fertilizers, pesticides, and other inputs. Jennifer, who has a background in media studies, is the team’s product lead and lead pitcher. Padiki, who has a degree in nutrition and food sciences, is in charge of customer relations. Edna Sawe, who also trained at MEST, is the cohort’s only female software developer and is the Chief Technology Officer of AgroSeal. Edna and her team are using mobile tools to connect fruit and vegetable producers with local transport and packaging providers in order to reduce post-harvest losses.